• This 272-page hard-covered volume by Brian Merlis, Lee Rosenzweig, and Oscar Israelowitz will be released in November 2011. The area covered stretches from Foster Avenue on the north to Avenue R on the south, between McDonald and Nostrand Avenues. 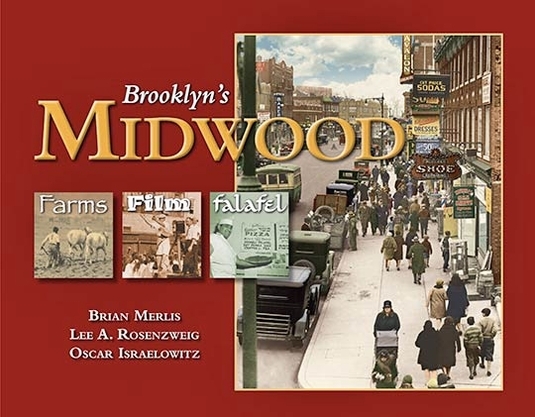 Generously illustrated with hundreds of rare vintage photographs, maps, and documents, this authoritative history traces Midwood�s past from its first settlement back in the 1600s until modern times. Chapters include Early Residential Development and Transportation, South Greenfield, Public Schools, Churches and Synagogues, sections on the area�s many thoroughfares such as Kings Highway, Ocean Avenue and Parkway, The Lettered Avenues, Coney Island Avenue, others. A colorful chapter about the famed Vitagraph movie studios was written by Shakespearean scholar Irvin Leigh Matus, who grew up not far away. A _must-have� for all Midwood households or those familiar with this section, this scholarly book will be a keepsake for generations to come. • Profusely illustrated with HUNDREDS of maps, illustrations, and vintage photographs, Brian Merlis, Lee Rosenzweig, and Oscar Israelowitz, authors of Brooklyn's Midwood: Farms, Film, Falafel (2011) take readers on another unforgettable journey back in time. A MUST for any collector.